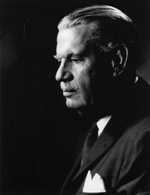 John Donald Robb (1892-1989) led a rich and varied life as an attorney, composer, arts educator, and folk song collector and preservationist. He composed an impressive body of work including symphonies, concertos, sonatas, chamber and other instrumental music, choral works, songs, and arrangements of folk songs, two operas, including Little Jo, a musical comedy, Joy Comes to Deadhorse, and more than 65 electronic works. Robb’s orchestral works have been played by many major orchestras in the United States and abroad under noted conductors, such as Hans Lange, Maurice Bonney, Maurice Abravanel, Leonard Slatkin, Gilberto Orellano, Yoshimi Takeda, Guillermo Figueroa, James Richards and Franz Vote. During his two decades as an international lawyer in New York City, Robb studied composition with Horatio Parker, Darius Milhaud, Roy Harris, Paul Hindemith and Nadia Boulanger. In 1941, at the age of 49, Robb left his law career to become head of the Music Department at the University of New Mexico. He served as dean of the UNM College of Fine Arts from 1942-57. During his tenure at UNM, Robb’s fascination with Hispanic folk music led to his recording of more than 3,000 traditional Hispanic folksongs and dances from the American Southwest and South America, all of which formed the nucleus of the John Donald Robb Archive of Southwestern Music at the University of New Mexico. He was the author of several books on the subject, including Hispanic Folk Songs of New Mexico (1954; revised edition by UNM Press, 2008) and his authoritative book, Hispanic Folk Music of New Mexico and the Southwest: A Self Portrait of a People (University of Oklahoma Press, 1980; republished by UNM Press, 2014), and a second volume of Hispanic Folk Songs collected by Robb, Cancionero: Songs of Laughter & Faith in New Mexico (UNM Press 2016). Robb received numerous honors and grants, including the honorary Doctor of Music from the University of New Mexico. Robb's music has been performed by more than 16 symphony orchestras in the U.S., Central America and South America, including the New Mexico Symphony Orchestra. His compositions have been performed in many other venues, such as six recitals in Carnegie Recital Hall in New York (some of which were reviewed by the New York Times). The St. Louis Symphony premiered his Third Symphony in 1962, and his music is performed every spring at the renowned UNM John Donald Robb Composers’ Symposium. His folk opera, Little Jo, was conducted by Guillermo Figueroa at the National Hispanic Cultural Center in 2005, and the New Mexico Symphony Orchestra under Figueroa performed his Dances from Taxco in their 2007 season. In June 2008, KNME-TV, New Mexico's PBS station, premiered an Emmy Award documentary about Robb entitled, "The Musical Adventures of John Donald Robb in New Mexico." The documentary can be viewed at an interactive website that features folk song recordings and photographs from the Robb archives from UNM Libraries' Center for Southwest Research. In October 2008, the University of Missouri-St. Louis presented a John Donald Robb Tribute Concert to a standing-room-only audience, and in November 2010, Robb's Symphony No. 1 was performed by James Richards and the St. Louis Chamber Orchestra. Robb’s Requiem, composed in 1985 when Robb was 93, was performed by the St. Louis Bach Society conducted by A. Dennis Sparger in 2012 as a choral and piano piece edited and arranged by James Bratcher. A newly orchestrated version of Robb’s Requiem was performed in a 2013 Santa Fe concert presented by the New Mexico Performing Arts Society featuring conductor Franz Vote and the New Mexico Bach Society, and in 2016 Robb’s setting of "Los Pastores," the traditional folk play from Spain and Mexico, arranged for SATB Chorus and 11 instruments, was performed by Franz Vote and the New Mexico Bach Society at Cristo Rey Catholic Church in Santa Fe. Robb’s Two Trios, Opus 57, I Am Very Old Tonight and Tears, originally written in 1953 for Contralto, Oboe and Piano and later arranged for Women’s Chorus, Oboe, and Piano were performed in 2017 during “The Granados Project” by Polyphony, Voices of New Mexico and UNM’s Las Cantantes conducted by Maxine Thevenot in St. John’s Episcopal Cathedral, Albuquerque. OPUS ONE Recordings has released seven Hispanic folk songs and six art songs arranged by Roger Jannotta and performed by the world-renowned National Polish Radio Symphony Orchestra conducted by David Oberg of Albuquerque with Leslie Umphrey of the UNM Music Department Faculty as soprano soloist. This is the fourth of the outstanding CDs of Robb’s major works on the OPUS ONE label by Oberg and the NPRSO. All are available through Amazon.com. When Robb was in his 70s, he became one of the first in the country to buy a Moog synthesizer and proceeded to compose a body of work for that revolutionary instrument. He is recognized as a pioneer in that field. All genres of his works are still performed today.